I am lying on the floor in the lounge room waiting for peace. Tom has taken Sam and Gus out for the afternoon, which is a good start, but the silence coupled with the choices I have have rendered me inert. My brain is doing that thing that it does. It’s kind of flipping through thoughts and ideas like a Rolodex, landing momentarily on one and then “flaaaaart” flicking through to the next. Sometimes – mostly in times like this – I seriously wonder if I am quite mad. On the whole, I’m quite happy – which is a great place to start from – but occasionally, the beginning of a new year can feel like standing at the foot of an insurmountable cliff face…which is better than looking from the other end, I guess. 2012 was quite a year. I didn’t write in my personal journal for the whole year – I picked it up and read it this morning. The journal dates back to January 2010. Whilst I cringed when I read it from the beginning, I discovered I only pick it up when I feel overwhelmingly crap or pleased with myself. Which suggests that 2012 was a year of either flattening out the highs and the lows, or merely that I managed them better. In 2012, for the first time ever, I stuck at something week in, week out for the entire year. Apart from one week in each month where I had a commitment clash, I attended a yoga class, followed by a deep relaxation and meditation session every single Tuesday evening without fail. Looking back now, I truly believe that this is the cornerstone for how everything else panned out during the year. I gave up smoking in March, and I admit falling into a “party fag” hole in the latter part of the year, I have definitely kicked the habit. I am now a shameless bot at a party so you can guess what’s on the “2013 To Do List”. It wasn’t hard, I was more than ready, and I just stopped. My husband stopped too, which helped. In 2012 I gave up sugar – completely – for eight weeks, which was surprisingly easy to do and I have adopted the principle as a general rule of thumb on an ongoing basis. Once you learn something new, it’s hard to unlearn it, but I have definitely weakened in the dessert department over the party season. Which has added a page to the mental Rolodex / To Do List entitled “Shed Christmas Kilos”. This is doubly annoying as I also lost 8kg in 2012 on the HCG Diet over a total period of 6 weeks. I’ve plonked about 2.5 back on through sheer mindless eating and drinking over the past three months’ as opposed to any shortcoming in the diet. I will be undertaking the exercise again – this time, perhaps more sagely, on the way OUT OF rather than IN TO the party season! Another impressive feat has been the introduction of a morning walk each day with a good friend. Partnering up filled me with a strong sense of obligation, meaning I actually turned up every morning. Over the past months we have managed to double our distance, halve our walk-time and shed pesky kilos as well. My husband stood in for my friend one morning when she couldn’t make it – the conversation wasn’t nearly as good, but his intent was equally as pure. My friend has taken the bull by the horns and swapped a couple of our morning walks for a Spin class – or something equally as horrendous – a pleasure I will continue to merely wonder about, and admire from afar. Sometimes you can just take things too far. While Annemaree traverses India, I am on a yoga hiatus, which tends to allow a small crack through which pointless thought streams, negative self-talk and catastrophic scenarios can creep. I have downloaded a “Mindfulness” app on my iPhone which allows me to do a simple morning meditation for a length of my choosing – it’s like Selleys No More Gaps for my mind. I wish you a truly wondrous 2013, I am really looking forward to learning, trying, falling, succeeding and sharing in this space for another year if you’ll have me. The first time I heard this term I was sitting in my GP’s office having my anti-anxiety medication script re-filled. Cool as a cucumber, she looked at me and said “Anita, have you been catastrophising again?” It’s a great word – applicable to myriad scenarios. I decided to write about “catastrophising” a week or so ago and since then it has manifested itself in many conversations. Some of the great catastrophisers of our time include Chicken “The Sky is Falling” Little and the child in Kindergarten Cop who suggests Arnold Schwarzenegger’s headache is most likely a brain tumor. This may seem amusing, but this poor kid probably had a mother like me – I’ll explain later. It’s a funny old world we live in, which facilitates, encourages and endorses a catastrophic way of thinking. Just watch the news. My 3yo once asked me why I watch the news; my 6yo answered – “it’s because you need to find out all the bad things that have happened in the world”. My 6yo is a Master Catastrophiser (hence his nickname: “Worst-Case-Scenario-Mario” or “The Master of Disaster”), but I think he is bang-on in this observation. For a watered down (but doubly toxic) version of “monsters under the bed” reporting, catch a glimpse of “A Current Affair” or “Today Tonight”! Helping you keep one step ahead of all of those trades-people and supermarkets that make it their life’s work to rip you off. Oh, puh-lease. My husband comes home from work exhausted and beaten; dying a death of a thousand cuts – paper-cuts that is! The industry in which he works is living proof of The Chaos Theorem. Instead of a butterfly flapping its wings in Santiago – if a man falls off a ladder in Broadmeadows, the rest of the building industry drowns in red tape and paperwork now – and ad infinitum. When – exactly – did we stop taking responsibility for our own actions? If I trip over raised concrete in the street – making me look and feel like a bit of a dill – should the council / the layer of the concrete / the tree’s roots that lifted the concrete / the planter of the tree / the creator of all things pay [me] for that? Whilst catastrophising ensures I feel that EVERYTHING is my responsibility, I live in a litigious society which promotes the fact that it’s all someone else’s fault! I choose to laugh at myself tripping over the tree root, bung a Band-Aid on my face and learn to watch where I’m walking. Accidents happen. Move on – more carefully. You can take this on good authority as a woman with a ripping scar and nine screws permanently in her left hand after a martini-induced dance-floor mishap. With friends…at home. I previously worked in a sales role in which I lived and died by the monthly numbers. Here, the world ended (for some people, quite literally) on the last day of the month. It began again on Day 1 of the following. It was constantly and oppressively stressful. It was an environment in which it was very hard to achieve just the sales targets, let alone navigate the vicious office politics. A previous boss of mine, whom I hold in very high regard as a coach and mentor and who remains a good friend, offered me advice once on how to survive the environment. He told me to always prepare for – and expect – the worst, so whatever happens will always be better than what you imagined. This person also unconsciously chews the hair off his arms under stress, suffered a minor stroke and has on-going heart concerns – so whilst I appreciate the sentiment, hindsight suggests I take these pearls of wisdom with a couple of handfuls of salt. He, on the other hand, should probably lay off it. We are both out of that game now. Relaxed, happy and successful – able to enjoy a laugh about “those days” together with our families – over a few “too many” vinos! Catastrophising is not purely a corporate phenomenon. In fact, it was not until I became a mother that I truly unearthed my innate talent to catastrophise. Becoming a mother raises the stakes immediately. It begins in pregnancy. The books. Oh! The books. I stopped reading the books. I was convinced early in the gestational period that eating a single piece of soft cheese was going to result in my having a child with severe disabilities; one who would surely require round-the-clock specialist care; most probably within an institution – with a team of Swedish neurological experts (who would “tsk-tsk” (in Swedish) in my general direction, whispering to one another “this would never have happened if she hadn’t eaten the cheese”). From this point, having children – I have heard described beautifully – is “like having your heart walking around outside your body”. From a place of intense love and a primal instinct to protect, also comes a tsunami of catastrophising thoughts. You think your headache is an undiagnosed brain tumor (refer Arnie, earlier). You hear a cough from your child’s bedroom in the middle of the night and curse your GP for not picking up the resurgence of Bubonic Plague. I think the more we pretend that everything is okay the more we damage one another. 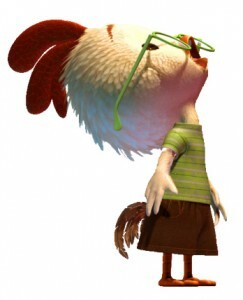 Chicken Little may have been deemed a crackpot after the acorn incident, but at least the chick voiced its fears aloud! By talking about our fears and anxieties THEY – not us – will break down. Sometimes giving your voice to the crazies – the monkeys – in your head can make them seem small and silly. Meditation gives me a small moment to look at them, sit with them, smile at them and put them aside. Leaving them left un-checked inside can wreak havoc on you mentally, spiritually and physically. Believe me, I know. This article has been contributed by Cool, Calm & Collected’s student, writer & eternal work-in-progress, Anita Quigley Atherton.